On March 11, 2011, a magnitude 9.0 earthquake struck Japan and triggered a massive tsunami that caused waves of up to 133 feet in the Iwate Prefecture. All told, 15,884 people died across 20 prefectures, and much of the country was left in complete disarray. Through all of the loss and destruction, one symbol of hope stood—the ippon matsu, or miracle pine. Where more than 70,000 pine trees were knocked down at Takata Matsubara, the ippon matsu remained standing, serving as a constant reminder of Japan’s enduring spirit. 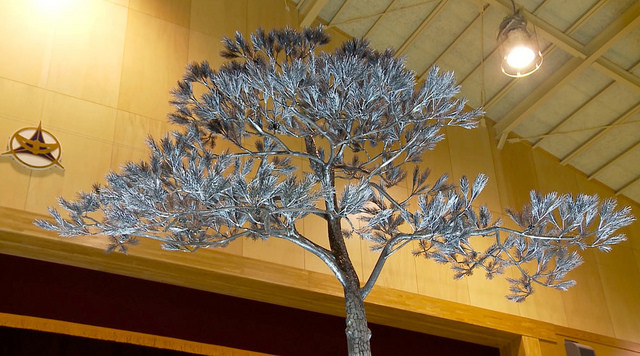 Though it is no longer standing, the miracle pine became such a symbol of optimism for the people of Japan and Rikuzentakata (where the tree once stood) that member companies of the Japan Automobile Manufacturers Association (JAMA) teamed up to build the kibou no ippon matsu, or “The Tree of Hope,” which stands as a monument to all of those who died. 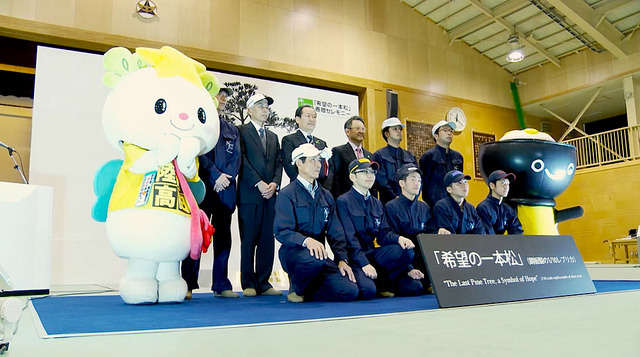 Nine technicians from Nissan, Toyota, Mitsubishi, Mazda, and Hino first sketched out “The Tree of Hope” in September. In the time since, they have lovingly handcrafted the statue, whose bark is comprised of 4,000 individual pieces and whose pine needles number 1,000. In addition, there are 20 pine cones, of which seven were built using scrap metal salvaged from derelict vehicles. “The Tree of Hope” was recently presented to city in a ceremony that included a moment of silence and students singing “Asu toiu hi ga” (“If Tomorrow Never Comes”).